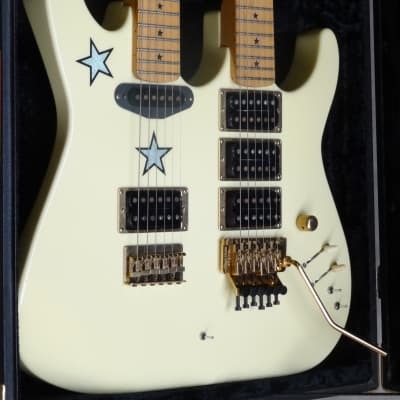 KRAMER made the RICHIE SAMBORA SIGNATURE model as part of their Artist Series between 1987 and 1989. This model was a super-strat based on the old pacer body shape but with a more rounded edge. A distinctive star shaped sticker adorns the top of the body and there are matching star shaped fingerboard inlays. Pickups are three Seymour Duncan Jazz (SH-2) humbuckers (JBs at the bridge and middle with a JN in the neck position). This model was discontinued in 1989 when Sambora agreed a Fender signature deal. "The first thing you notice about the Richie Sambora model is its unique visual design. Play the guitar and you can feel the power and presence of this hard-driving rock & roll instrument. Richie, lead guitarist of Bon Jovi, designed this guitar with two requirements in mind. The guitar had to deliver a solid, straight ahead rock & roll sound combine with striking stage presence. The 25-inch scale body enhanced with gold hardware uses the "Original" Floyd Rose Tremolo. Unique star-shaped pearl inlays are offered on either a maple or rosewood fingerboard. Three Seymour Duncan humbucking pickups give more full-blown power than other rock guitars in its class"
Some examples of this model were made in Japan. This model was reissued in 2004 following Gibson's aquisition of Kramer - as the Korean made Musicyo Jersey Star model. This reissue has an actual star inlay in the body (rather than a sticker), white finish and maple fingerboard. 1987 $1249 new guitar-list Recommended retail price. 1989 $1200 new craig petrasek absolutely in new condition, only played a couple times, NO finish loss whatsoever on gold hardware. you will not find another in this pristine condition. 1989 €1200 good Francisco I had been trying for a long time to find this original model of the time. There are very few and although it has some bumps and scratches this original in all its components and in perfect state of usability, it´s very complicated to find this guitar. Take the KRAMER RICHIE SAMBORA SIGNATURE price survey. Buy KRAMER RICHIE SAMBORA SIGNATURE electric guitars.